When content is localized, the information and message from the source text are reflected in the target text, but the content is modified as much as necessary to be appropriate for and effective in the respective geographic region. For example, units of measurement or currencies may have to be converted, examples or analogies changed so that people from that region can relate to them, humor may have to be adjusted to be perceived as funny rather than offensive, certain information may have to be added or omitted. Oftentimes more than just the wording needs to be localized. For marketing collateral or websites, you may need to localize the colors, pictures, and other graphics to appeal to the local market. Differences between the German and the U.S.-American culture are oftentimes underestimated. Both are western, progressive countries that have been enjoying strong ties with each other for many decades and that have been partnering politically, diplomatically, and economically. When visiting the other country, at first glance the differences may seem few and insignificant. But despite the many commonalities, people in the two countries take different approaches to various aspects of life as a result of different cultural standards and preferences. For example, Germans prefer a deductive presentation style (as opposed to the inductive presentation style that is common in the U.S.). 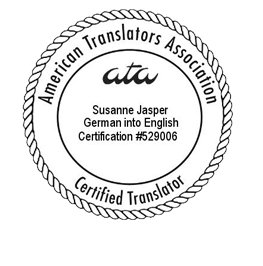 Not introducing the sources and methods of your research and analysis that you base the information and arguments in your presentation on may make your German audience quickly question their validity and your competence. German marketing content writers, just like their American peers, create wording that elicits enthusiasm about the advertised product or service. However, your American enthusiasm—and wording—may be (way) over the top by German standards; it’ll likely need to be tuned down a notch or you may lose credibility with your German audience. When corresponding with customers, business partners, and even colleagues, you may need to be (a lot) more formal or you could come across disrespectful. At the same time, Germans oftentimes choose more direct and assertive wording, which may seem harsh by American standards. The more indirect communication style that is common in the U.S. can be easily misinterpreted by Germans as being wishy-washy.